Well hello there, back in lovely Marsden now having had a very nice time and got lots of work done! Just thought I would share with you the fruits of my labour last weekend. 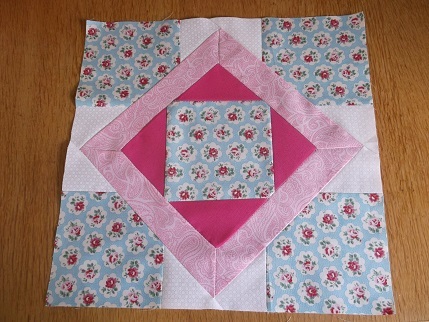 This month’s block did look like a bit of a challenge when Helen originally posted it – a Nine Patch Frame so she had the first go and very kindly supplied the measurements. It turned out to be not too bad, as you can see I have not really got my frame far enough out as it was a tricky devil to sew with those corners so my outer white triangles are not as good as they could be and have lost some of the points on the inner square but I like the fabric combinations. 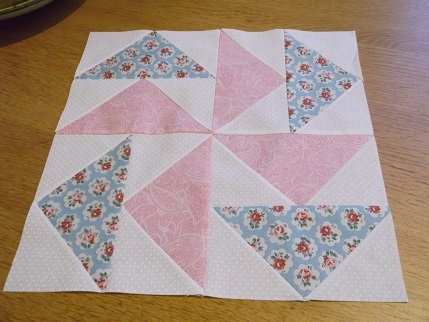 Here is the Feb block Union Squares – the right sized one! 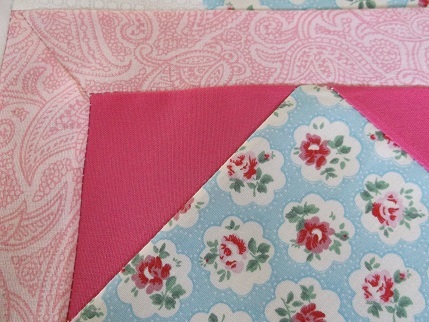 Will probably try and get the next 3 in these fabrics and make this into a small quilt, each block is 12 inches so will be cot sized with borders and can go to local hospice or Project Linus. 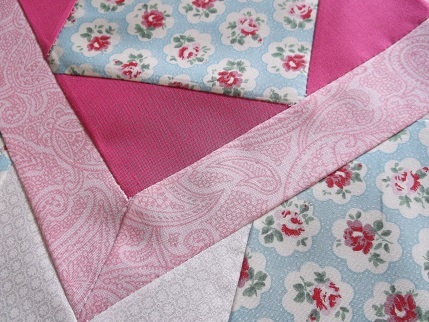 Then do the next 6 in different fabrics. 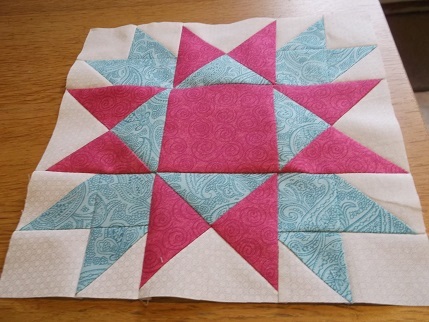 Sharon jokingly suggested this might be our next block challenge. 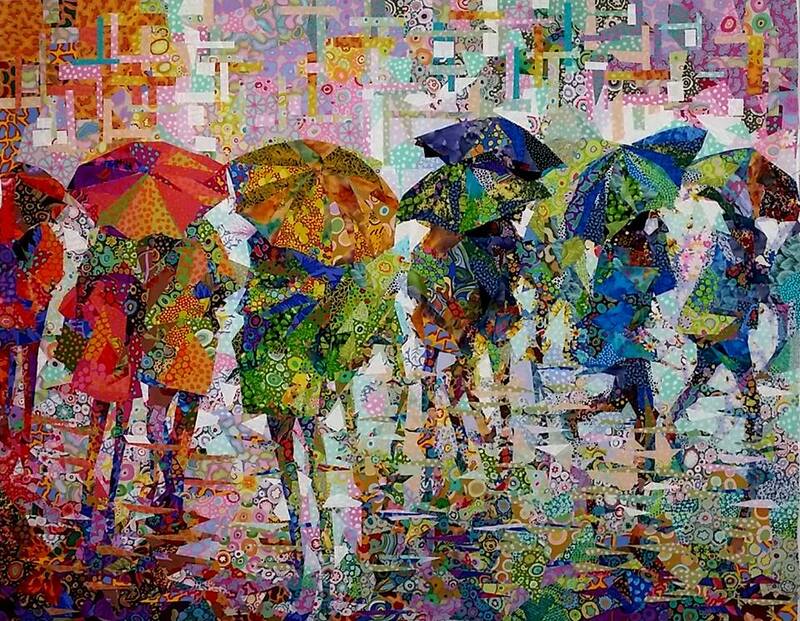 This is work by Danny Amazonas using fabrics from the Kaffe Fassett Collective – wow, just wow! Can’t believe it is nearly the weekend already – how exciting! It is very lovely and sunny here today so hope that continues and I can get some walking done as well as stitching. Hope you have a nice time planned and thanks for visiting.